In the highest of honour I will remember Splitting the Sky who died suddenly March 13 2013 in Adam's Lake, BC. 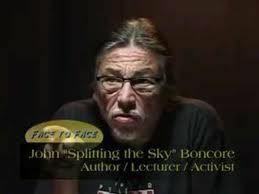 Splitting the Sky, also know as John Boncore, his colonial name, aged 61, was one of the most fierce, uncompromising, warriors I have ever met. He was fighting the pipeline in northern BC at the time of his death, but has been involved in sovereignty issues and many human rights and ecojustice campaigns all over the world. As survivor of the prison uprising in Attica and a member of AIM (American Indian Movement) he came to Surrey, BC during the trial of the Sundancers of Tspeten, the Gustafson Lake standoff, the longest trial in BC history. That is where I met him. He tried to arrest George Bush for war crimes, and was an ally of social justice battles everywhere. His fierce spirit, big heart, and huge smile and sense of humour is what I will remember of Splitting the Sky. I doubt he will rest in peace, as there is yet no justice. I suspect his fighting spirit will return to encourage those of us who remain to keep up the battle for all peoples, and all our relations. I will always remember Splitting the Sky, and his cry for justice! "Please- if someone tells you that I died from a slip and fall..
Not everyone thought of John as a hero. After his death I thought of a quote by another famous aboriginal man Mr. Will Rogers - "We can't all be heroes, because somebody has to sit on the curb and applaud when they go by."